This is Leo's other scan. Would the cancel be one duplex cancel or is the single circle and bars two seperate items? They look to be together but on my cover they are seperate. 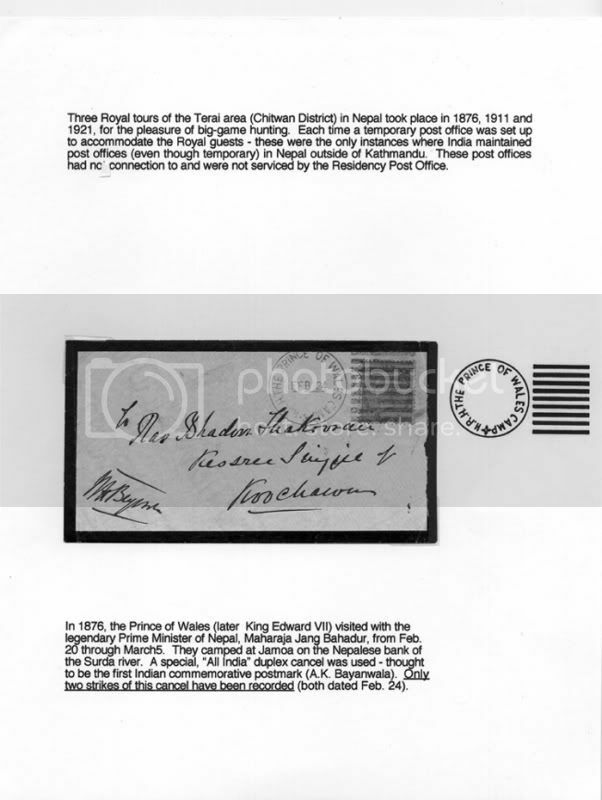 I believe The Royal Guest House Post Office was used occassionally for visits of other VIP's to Nepal although I only have a 'philatelic' cover dated 11 May 1963. I believe it is a duplex type cancel. Hellrigl describes it as such. 4. Queen Elisabeth and Charles following the Royal tradition of visiting Nepal - not hunting!!! I just found the shown cover on ebay and thought to post the picture before the auction disappears. I checked out the cover on eBay. Also there is a bit of a prolem with it. Acccording to Dr. Hellrigl, the prince was in Nepal from December 14th to the 21st. This cover is dated in November. Thanks for your comment. Since the cover is dated November, does this mean the cover is "bogus" or has the cancel just been used at a later date, maybe a favor cancel? I believe that these Camp cancels were used during the Princes of Wales various trips through out India as well as Nepal. The date of the cancel determines the location. The cover is genuine. This does not quite fit with the heading which possibly should be altered to Royal Visits in Nepal from 1876 if possible. (Done by Administrator). The Prince of Wales left Portsmouth on 26th October 1921 finally arriving in Bombay 17th November having called at Gibraltar, Malta, , Egypt, Suez and Aden en route. He travelled India extensively until 17th March 1922. From here he went to Ceylon, Malaya, Singapore, Hong Kong, Japan, Manila Brunei, and Penang before returning to Plymouth 20th June 1922. A trip of 8 months. There are 4 things to look four. The common cancel as the one above. My example below is on POW stationary and was sent by one of the military personel. I have never considered looking for covers dated in Nepal. Would you class these as desirable during the dates in Nepal? Looking through photocopies I have I did find one dated in Nepal and a closer look makes me think I maybe should have aquired it. Can anyone shed any light on the signature in the corner? 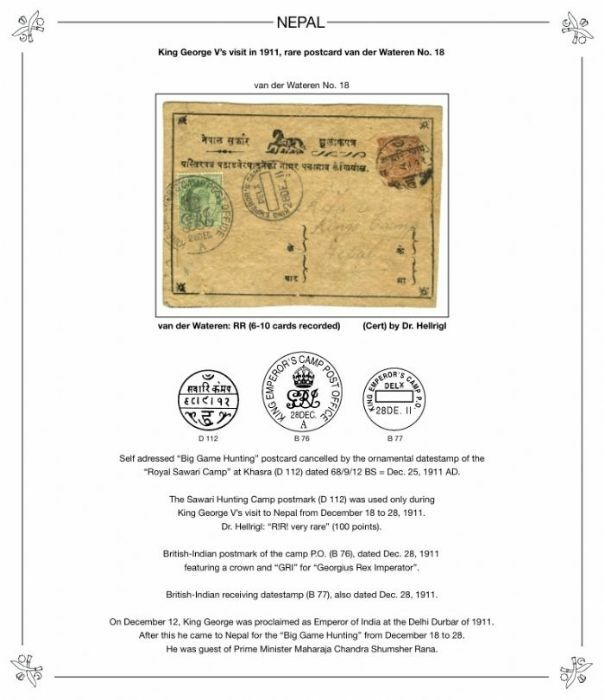 I have just added a section on Prime Minister Hunting Camp Mail to my web site at Nepalstamps.com. A number of the covers shown here plus some new material are shown along with some additional information which may be of interest. 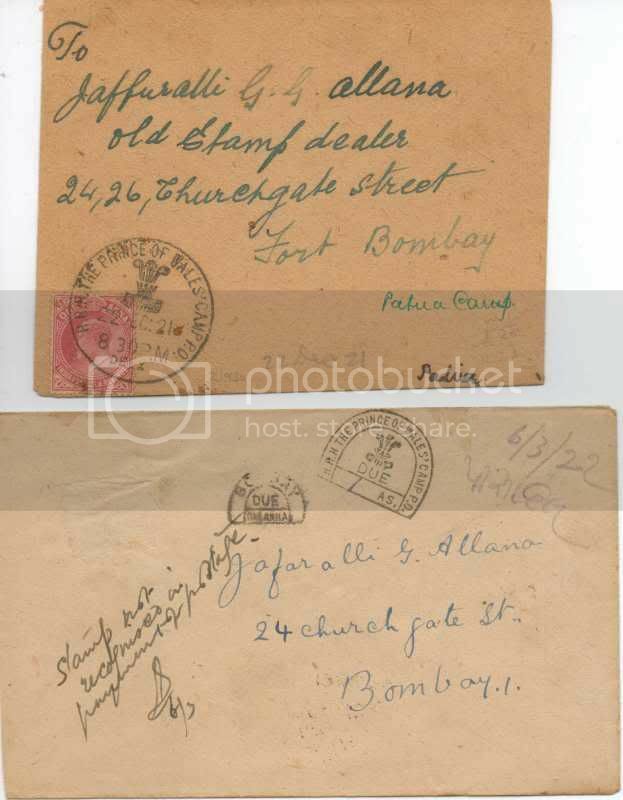 For the record, both the Nepalese and British/Indian Royal Camp Postmarks of 1911 were forged as shown on the cover pictured below. The forged Nepalese marking is a tiny bit larger than the genuine. 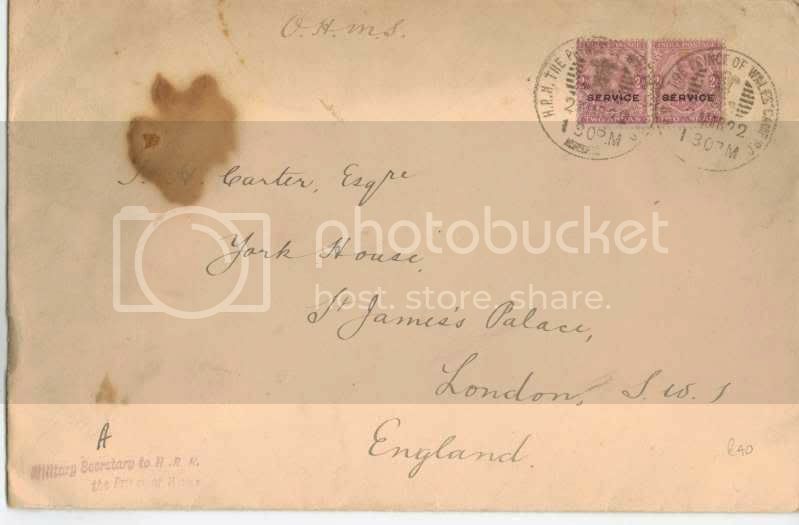 The bottoms of the G and the R in the GRI inscription on the British postmark do not overlap on the forged mark as they do on the genuine. This lack of overlap can just barely be seen inside the red square on the cover below. The forgeries are always dated 26 December. Dr. Hellrigl has good illustrations in his book on the British/Indian Post Office in Nepal. 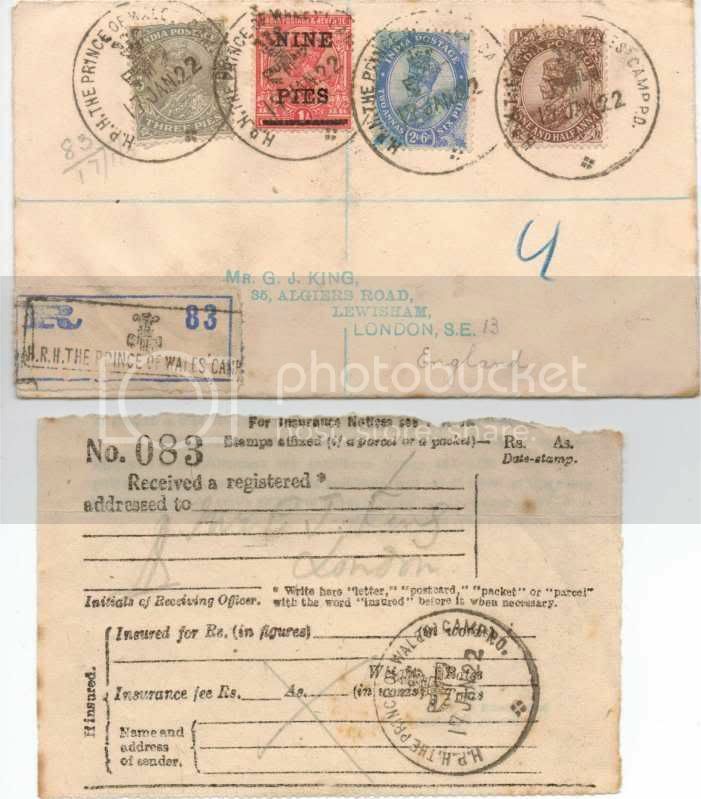 This cover appears to have been a genuine old cover addressed to London to which the Indian stamps and postmarks have been added over the original markings. 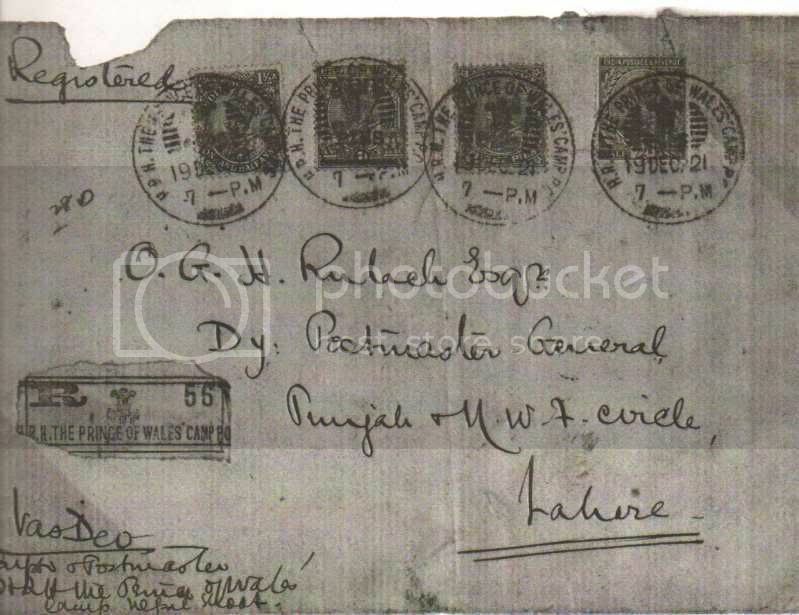 A small bit of an original postmark peeks through between the right most Indian and the Nepalese stamp. A reaaly nice section, Johannes. I enjoyed reading it. Excellent information. 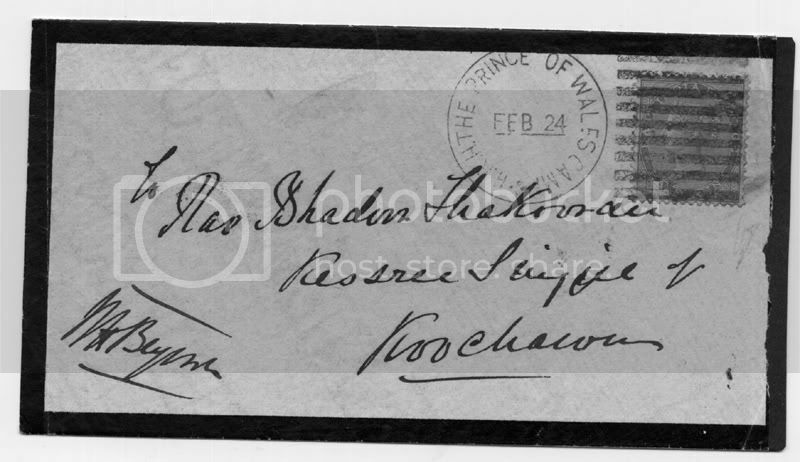 I have finally managed to get a cover from Nepal for the 1911 King Emperors visit following his attendance at the Durbar. It looks like there is a crease at the top right but this is more of a wrinkle in the paper as not on the reverse. All I need now is some information to help me write it up. Can anyone help? congratulation to your cover. In my exhibit I have a similar cover and I just show my description.